Screen shot of a bar magnet, the magnetic field and and compass. The Ejs Open Source 2 Bar Magnets & Compass Model shows the field of zero, one or two bar magnets and has a movable compass that reports the magnetic field values. The bar magnet modelis built by placing a group of magnetic dipoles along the bar magnet. Users can examine and edit the modelif Ejs is installed. Run the simulation. Move the compass around in the magnetic field of the magnet. Move the magnet around. What is the relation between the compass and the field vector (small arrows)? Test to see how well you can use the compass to determine the location of the magnet: Click on the Radomize position check box and then push the Hide Field button. Use the compass to show the direction of the magnetic field and then move the marker (same size as the magnet) to where you think the magnet is located. Click on Show Field to see if you were correct. If you were, describe your strategy. If you weren't, explain what went wrong and try again. The model uses a group of magnetic dipoles to build a model of a bar magnet. If you have Ejs installed, examine the model and determine how many dipoles are stacked together (and in what configuration) to create a model of a bar magnet. Giancoli, Physics for Scientists and Engineers, 4th edition, Chapter 27 (2008). 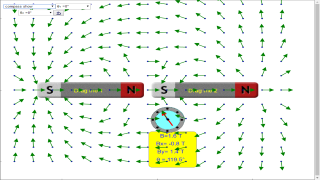 The2 Bar Magnets and Compass Model was created/remixed by lookang and can be found here http://www.phy.ntnu.edu.tw/ntnujava/index.php?topic=1602. I thank Wolfgang Christian, Francisco Esquembre and Anne J Cox for the original Ejs applet called Magnetic Bar Field Model http://www.compadre.org/osp/items/detail.cfm?ID=9414. I mostly thanks Fu-Kwun Hwang for the masterful educator for his informal learning discussion forum and guidance. I also used the Easy Java Simulations (EJS) authoring and modeling tool. Exercises written by Anne J Cox. I also used some creative commons pictures from the internet. Information about EJS is available at: <http://www.um.es/fem/Ejs/> and in the OSP ComPADRE collection <http://www.compadre.org/OSP/>.